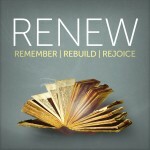 Through this series, we will take some time to renew the vision that God has given us. We want to actively pursue God’s plan for our church and our lives. Over the next three weeks we’ll talk about our past, our present and our future and we’ll see what God has in store for us as we continue to be faithful to Him.